A former Grove Farm executive from Kauai will serve as interim director of the state Department of Land and Natural Resources beginning Friday, Gov. Linda Lingle announced yesterday. Allan A. Smith, 61, will fill the vacancy created when the state Senate voted down Lingle's request that Peter Young continue in the director's job he held the past four years. Smith will serve until a permanent replacement is named, Lingle said. Smith was visible in his Grove Farm job after the March 14, 2006, breach of Ka Loko Dam, which killed seven people on Kauai. He said at that time that Grove Farm had started taking precautionary measures for its reservoirs -- including Waita Reservoir, Kauai's largest -- soon after heavy rains began. Some senators said the handling of dam inspections by Young's department before the Ka Loko Dam breach as one reason they opposed his reappointment. "I appreciate Allan's willingness to step forward to serve as DLNR interim director as the search committee looks for a permanent director," Lingle said. She appointed a 30-member search committee to find a permanent DLNR director last week, with Young as its leader. The governor said Smith's "history of leadership experience in land management and agribusiness will ensure a seamless transition as DLNR continues to work with environmental, Hawaiian, cultural, business and agricultural groups to protect, manage and enhance Hawaii's natural and cultural resources." Smith retired as senior vice president of Grove Farm last year after 19 years with the company. He managed the company's 40,000 acres on Kauai, including land development, construction, quarrying, forestry, diversified agriculture and commercial and industrial properties, according to a biography provided by the governor's office. Smith is a Kauai native who graduated from Kamehameha Schools and received a bachelor's degree in agricultural economics from the University of Hawaii. He also worked for Amfac Inc. on Kauai for 19 years, with positions at Lihue Plantation Co. and Kekaha Sugar Co.
Smith has supported Lingle in her statewide political campaigns and was chairman of the search committee to fill the DLNR director's position four years ago. "Allan is a person whom I trust. He knows me well and I know him well. 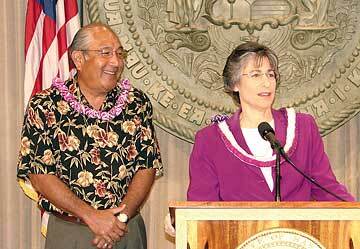 He also has tremendous respect not only on the island of Kauai but also throughout the state of Hawaii," Lingle said. Smith said yesterday he hasn't decided whether he will apply for the permanent DLNR director's job. Young said he expects to hold the first search committee meeting next week. Lingle said yesterday that Young will serve as the DLNR interim deputy director for water.